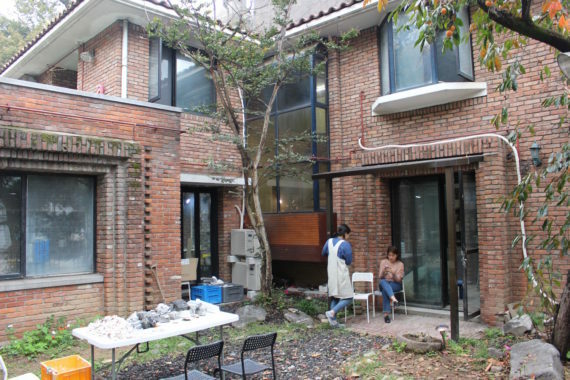 KyungWon accompanied me to visit Jongjin Park in his studio, which is in a town called Guri, south east of Seoul. The journey involved trains and buses and we ended up in downtown Geru you looking up at a semi circular glass fronted building. JongJin with there to greet us looking very smart and promptly took us out to lunch to an excellent Chinese restaurant. Yet again fabulously generous Korean hospitality! 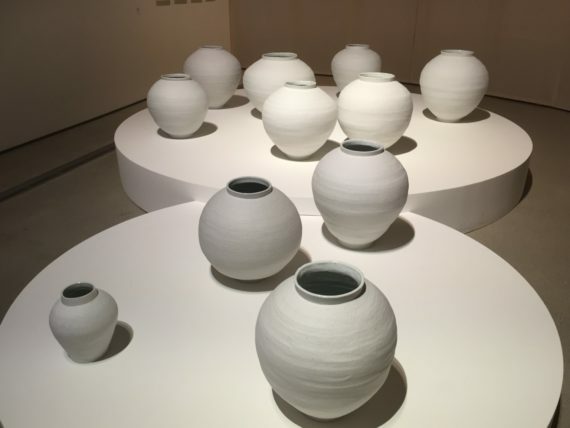 I first saw JongJin’s work at Ceramic Art London and then again the same year at Collect in 2015. 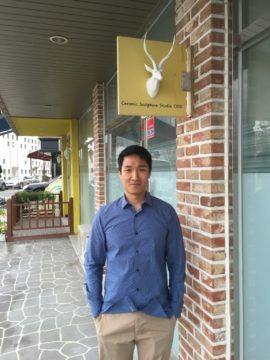 At the time he was studying an MA at Cardiff and has since gone back to study a PhD at Kookmin University, which he is currently working on. 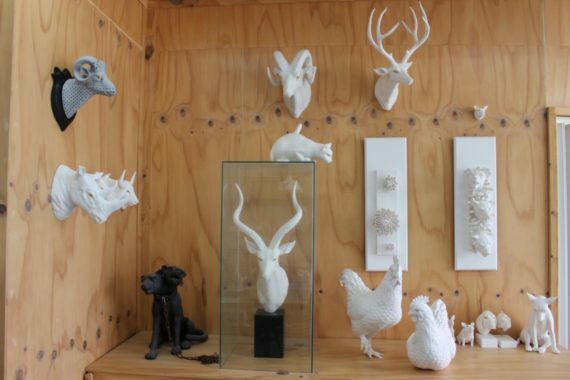 He shares the studio with two others but his work does seem to take over a lot of the space! 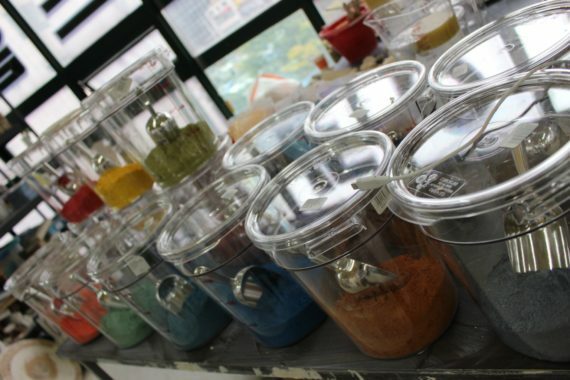 I was drawn to rows and rows of jars full of gorgeous pigments in a rainbow of hues. 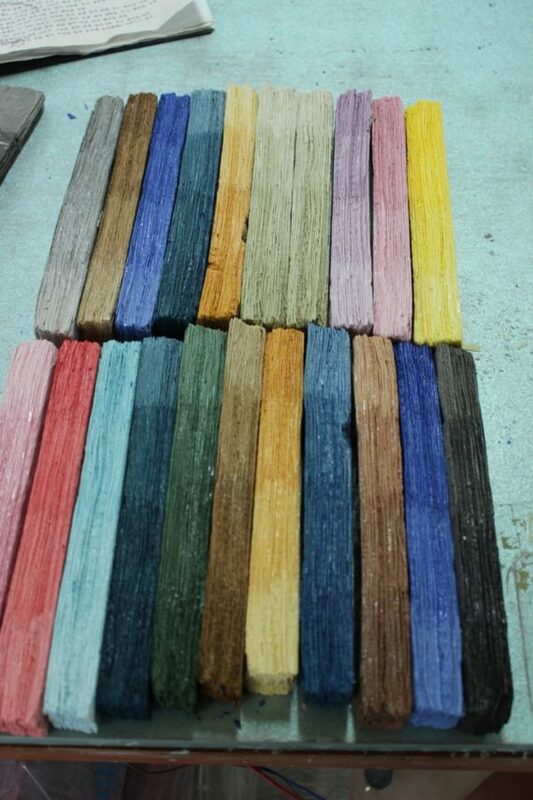 This is what that he uses to colour the slip he uses and his test samples, look so good the way they are all laid out in symmetrical patterns, he is thinking of making an installation piece with them. 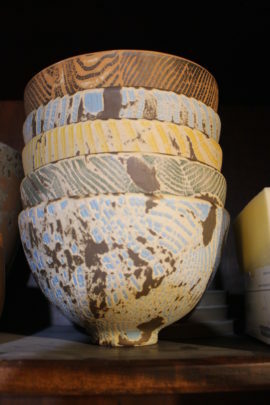 His work is very distinctive and he treated us to a demonstration. 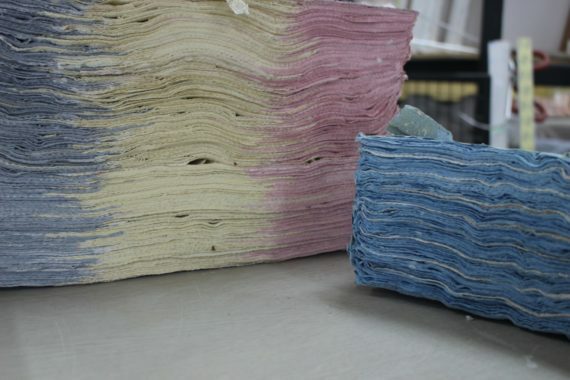 What he does is paint individual sheets of kitchen towel with coloured slips and layer then on top of each other. His work slightly resembles delicate, crumbling confections of millefeuille pastry and it’s coloured in pastel shades like candy too! 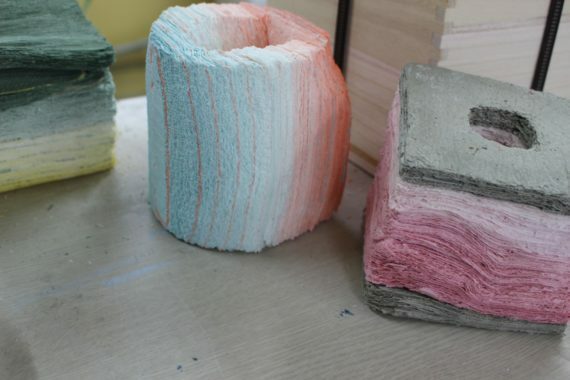 He layers up to 600 sheets in a single form. 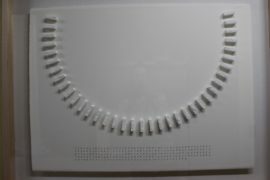 Incredibly time-consuming, labourious work, with astonishing and unique results. I am looking forward to having his work in the show! This was one of the bigger trips out of Seoul. Yanggu is a province but also a town situated in the north west of South Korea, quite close to the border with North Korea. Before coming to Korea several people had asked if I was going to North or South, which I took with humour, until I realized that tourist trips to North Korea are becoming more common and on the other hand some are very curious about what it is like in the North and expressed a fervent desire to go! Not for me! I’m happy to limit my experiences to firmly south of the border! Besides I have no time for tourism! Although I concede it would be interesting to know what it’s like. The rumours are probably true, that tours in North Korea are completely stage-managed and they only let you see what they want you to see. 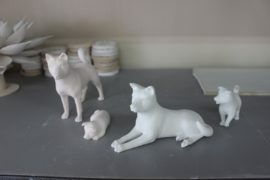 Anyway, I digress from the focus: ceramics! 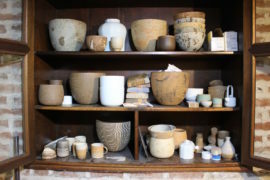 Yanggu is one of the famous sites for pottery production throughout the Joseon dynasty, which lasted for five hundred years right up until the early 20th Century. 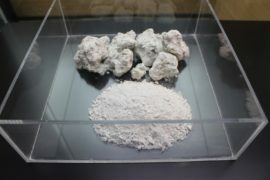 This is because kaolin and clay deposits are plentiful all over the area. 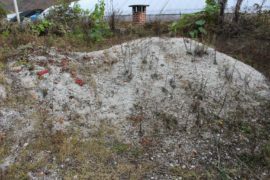 As soon as we arrived I was standing on a heap of white rocks – the raw materials for making ceramics right under my feet! I had been looking forward to this trip ever since meeting the three artists who are in residence there at the opening I went to on my first day in Seoul. 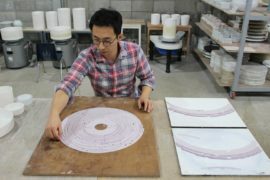 It was Deokho Kim’s solo show at LVS Project Space, who lives at Yanggu Porcelain Museum with Inhwa Lee, his wife, and Min Soo Kim, all graduates from Seoul University, all working in white porcelain with their own unique style. 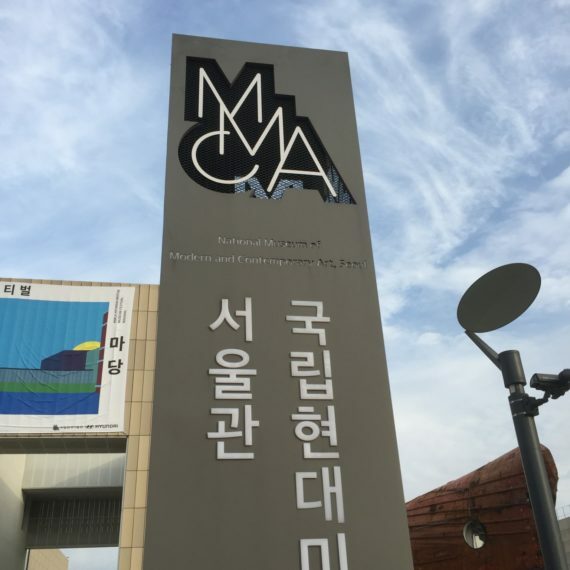 Min Soo is participating in Made in Korea. I first saw his work at Collect (Saatchi Gallery) in 2015, along with Inhwa Lee’s and Jae Jun Lee’s (the latter whom is also participating). 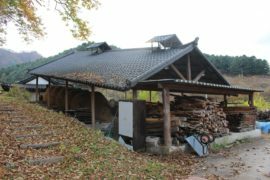 First, we went for a typical Korean lunch in an idyllic setting surrounded by rolling landscape and mountains all covered with autumnal-tinged trees. Beautiful, as was lunch, generously treated by Min Soo, with true Korean hospitality. 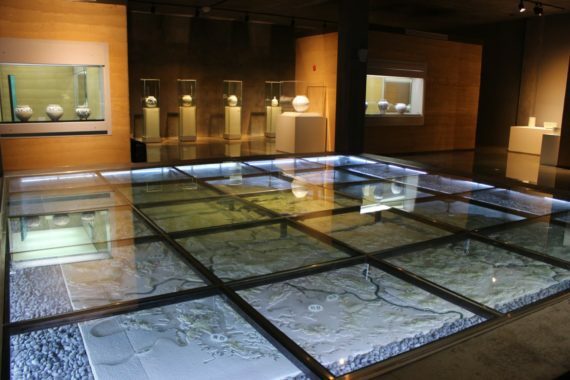 Then to the museum. 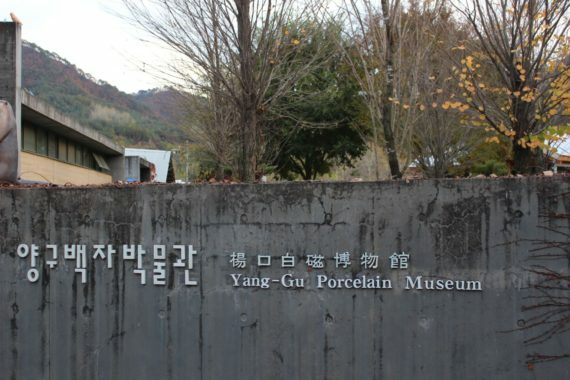 It is a fairly big complex, with several buildings – the museum itself, which celebrates Yanggu porcelain, a big education centre, and the AIR studio. What a place. I would not mind working there at all! It’s a massive, airy space, the height of a warehouse, but feels cosy and comfortable despite its size, aided by good light. 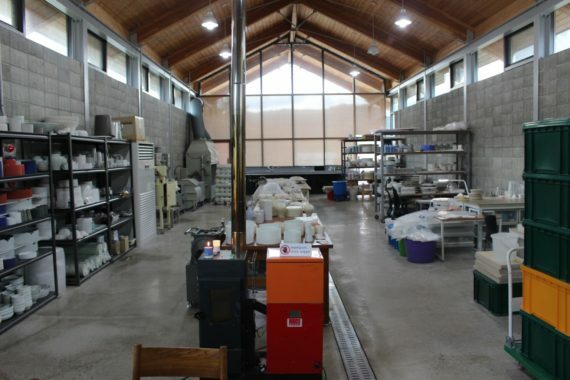 The artists have big spaces to work in and, as usual, excellent facilities all provided by the museum. 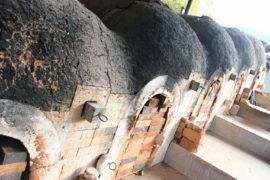 There is a wood-firing kiln – a traditional climbing Korean kiln – that gets fired at least twice a year. The setting is stunning, right on a broad river with a footbridge that leads across to the wood kiln and ideal for swimming in the summer. I guess the only drawback is that the town is tiny and there is nothing to do except work! But the artists love it there. 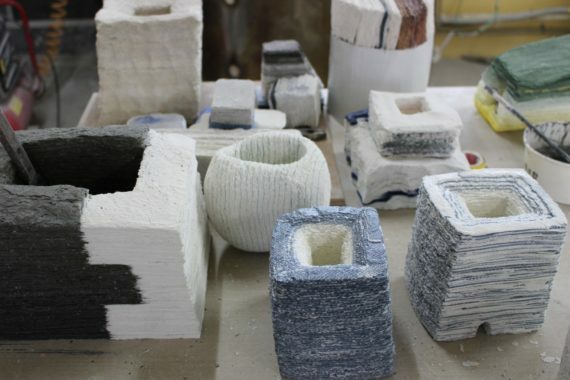 They are all successful makers, busy producing for exhibitions, all very accomplished. 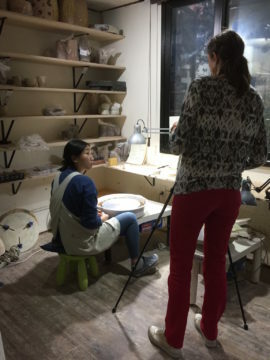 This residency is designed for graduates from Seoul University working in white porcelain, I believe, and everything is provided by the museum (I think!). So it is a great place to be an AIR. The curator of the museum gave me a tour of the complex and we talked at length about the new residency centre that they are constructing. 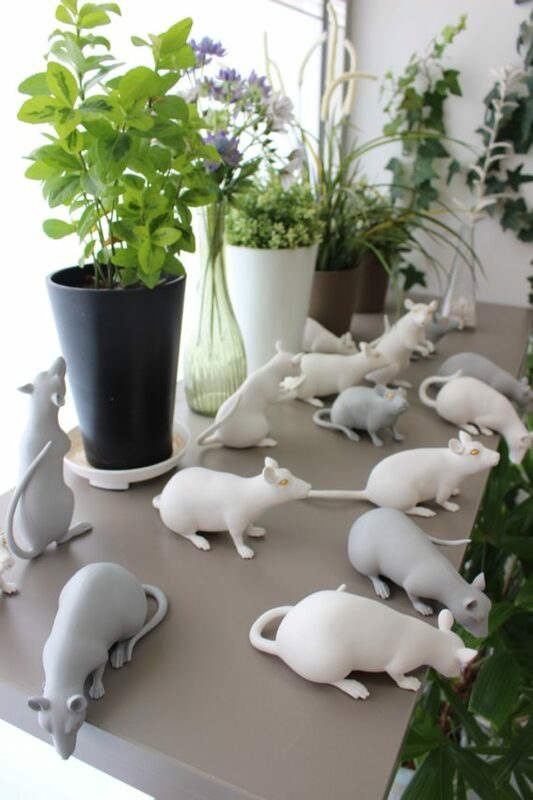 We went to visit a couple, both ceramists, who have taken up residence in a brand-new work/live unit in the new site across town. I saw the installation that one of them is sending to the Gyenog-gi Biennial and then we all went round the new building. It used to be a barracks and is being converted into a residence for artists. There is also a new workshop, which looks a bit forlorn right now because it is under construction. While talking with the curator and the AIRs, the idea of me doing a residency here was discussed, either with a solo show in the museum, or to create a piece of public art. When I mentioned my background as a public artist the curator became interested and I’m not surprised why! There are some fairly shocking examples of public art sprinkled around the site (condemned by all present!) So that is food for thought. The residency programme is not official yet, but he offered me to come whenever I want, with free accommodation, studio and firings I believe, which would be excellent, especially with an outcome such as a solo show or permanent piece in situ. 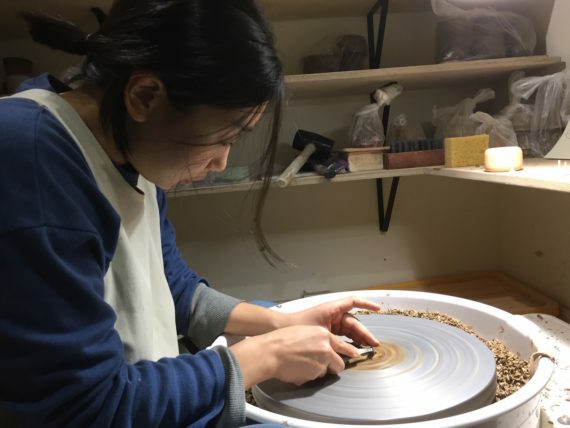 Originally my intention has been to come back to Korea to make my piece for Made in Korea, but then I veered away from the idea, thinking it would be too much to fit in before May. But I could come back later in the year and develop the new work to show at one of the other possibilities that has been discussed in Seoul in the autumn/winter… so let’s see what transpires. We all went out for dinner, again incredibly generous Korean hospitality, together with the couple I met today. 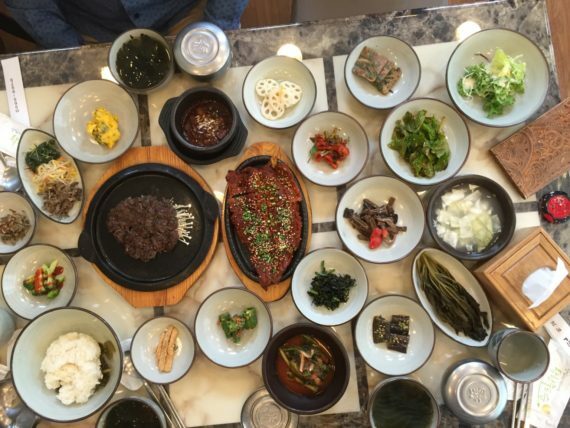 So that was two fabulous Korean feasts in one day! Delicious. 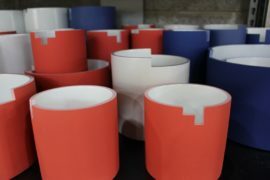 Wook Jae Maeng had been on my list ever since reading the article in Ceramic Review written by Hye Young Cho that inspired me to pursue this project. His unforgettable work consists mainly of wall-based figurative sculptures of animals, often fantastical, hybrid surrealist compositions. I found it so different to everything else I had seen and tracked him down. Kyung Won accompanied me, as usual. She was such an immense help, organising the schedule, coming to most appointments, and really going out of her way to help. 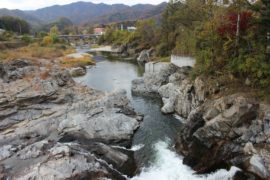 Goyang is a town north west of Seoul and to get there involved trains and buses, but it was a straightforward journey. Hye Young had tipped us off that the studio would be immaculate. In fact her words were that it is “like a hospital”, it is so clean. She was not wrong! 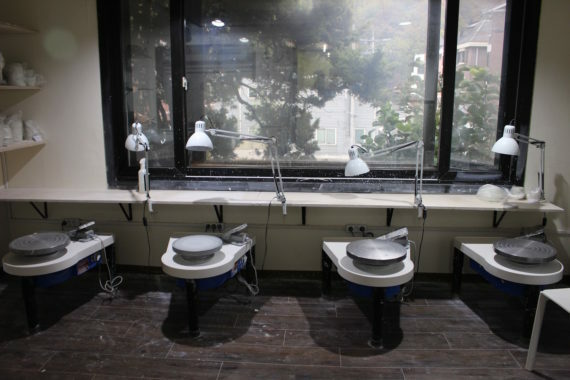 I have never seen such a clean and tidy ceramic working space. It doubles as his studio and showroom, with beautifully presented work on the walls and surfaces. 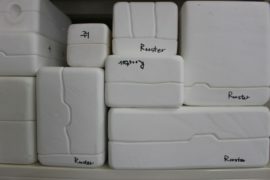 He had prepared for us, too, by unpacking some sculptures that were ready to be sent for an exhibition, and laid out an impressive collection of magazines featuring his work and catalogues. On one shelf was a collection of mice, and he showed me a photograph in a catalogue of the first iteration of this installation. 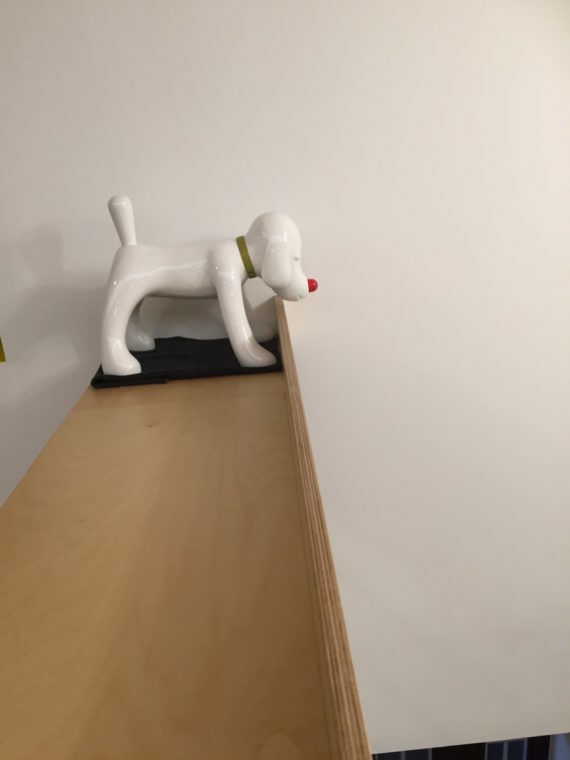 Ah-ha, I thought, how about having an installation of his work in the show, now that I know his likes to make installation pieces. It also brought to mind the idea of pairing him up with a sound artist who could create a sound piece for the installation. As soon as I mentioned this, oh yes, he said, I usually add some sound to the work! However, he means he finds sounds online. So now I have a lovely mission (or rather Joseph Young, my sound collaborator, does) to find a sound artist to work with Wook Jae. He treated us to a lovely Korean lunch before we headed back to the city. Korean hospitality is A+! So that little adventure into thinking about sound two days/two meetings in a row, with Chun Bok Lee and Wook Jae Maeng led nicely on to my only meeting with a sound artist in Seoul. Joseph had fixed this up. 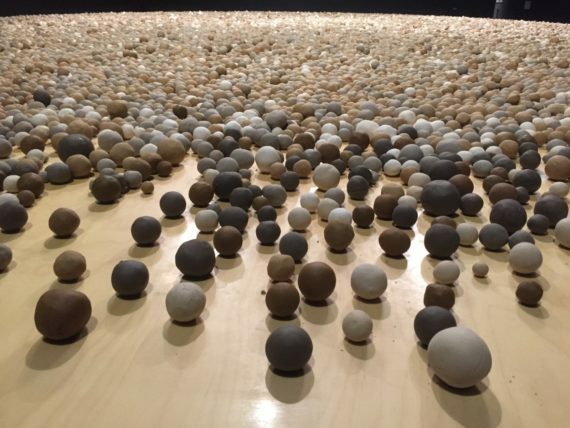 The artist is called Hankil Rye and is established on the sound art scene in Korea. He was in the middle of organising a sound performance festival at MMCA Seoul (Museum of Modern & Contemporary Art) over 3 days. 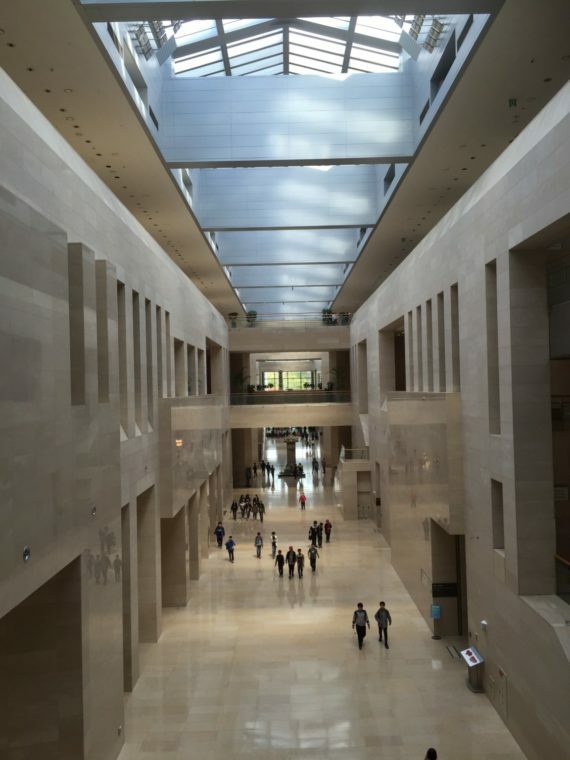 I went along after travelling back from visiting Wook Jae, and sadly only had an hour to visit what turned out to be an impressive, cavernous museum with multiple excellent exhibitions on. 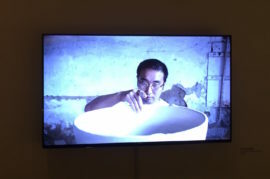 I was pleased to see that Kiho Kang, one of the Made in Korea artists, was featured in an exhibition called Craft Narrative: The Place, Process, Perspective about craft, with a good collection of his work alongside various other crafts makers, all presented with really good films showing their processes. Film is definitely a winner to include in exhibitions of craft and art practices. Hankil was pretty stressed – well, it was a big festival he was organising – and I was amazed he managed to take an hour out to talk to me. But it was a very productive meeting. He not only knows sound artists to put me in touch with, he also says he knows the perfect field recording artist (the only female sound artist specialising in field recording in Korea, so he says) who can record the bamboo forest for Chun Bok Lee. And on top of that, he is coming to the UK next year to stay for a while, so hopefully he will be able to collaborate in the exhibition too. 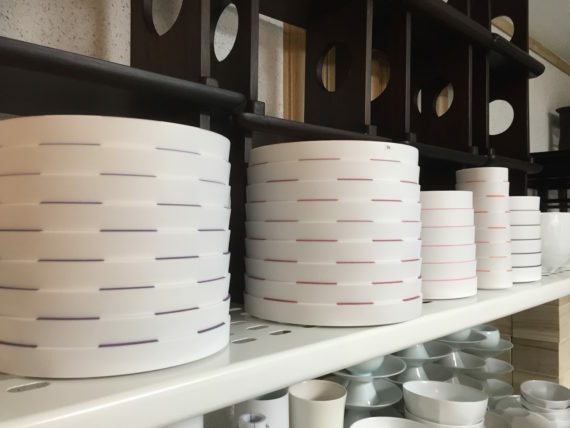 Having said that, the sound element of Made in Korea is totally dependent on a successful funding bid, which I am about to start work on very soon! 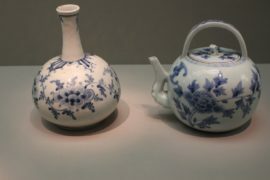 This morning was my first opportunity since arriving of getting to the National Museum of Korea. 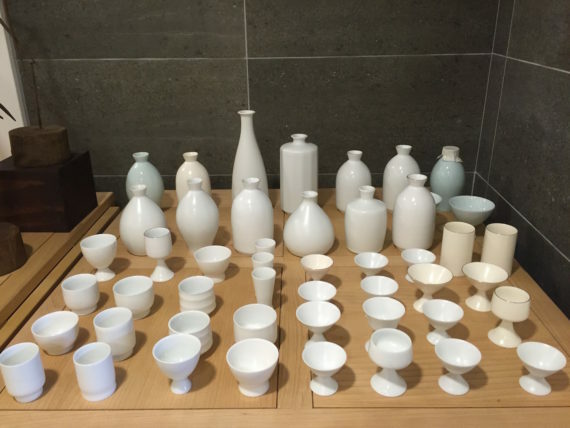 This is the place to see traditional Korean ceramics. I was not disappointed. The place is vast. 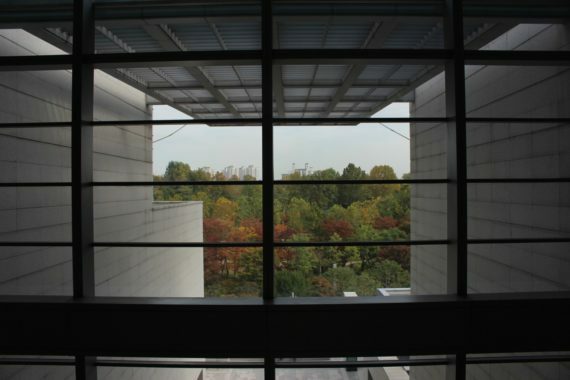 A monument to modern Korea, modern architecture, set in an immaculate park with trees, landscaping, water features, cafes, all seemingly brand new and pristine. 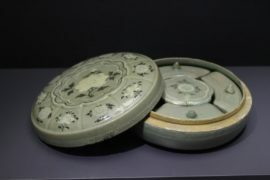 I started on the top floor, where the ceramic collections are: Porcelains, Celadons and Buncheong ware from the Joseon dynasty. Beautiful stuff. I took loads of photographs, as this may be where I draw inspiration from for my piece. 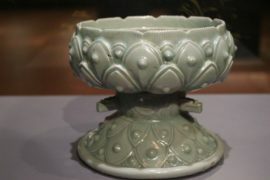 One of the ideas I am thinking about is to take inspiration from the classical motifs found on this era of Korean ceramics and possibly use various techniques that were used, which include inlaying, stamping, incising, sgraffito and free drawing with iron or slip and dipping into a slip bath. 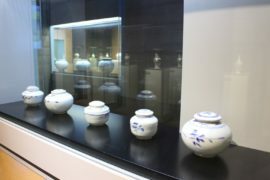 Then I worked my way through the donated collections on the second floor, which contain many types of artwork including ceramics. Right at the end, I discovered the Korean roof end tiles and was captivated. 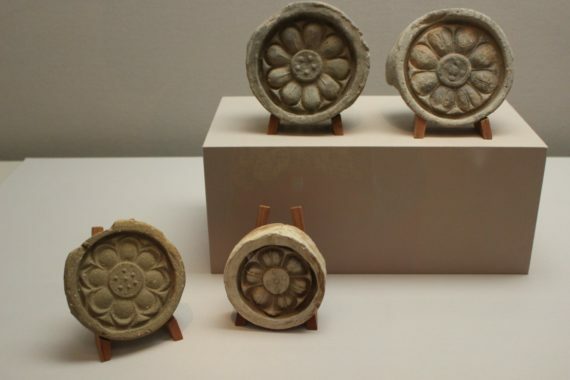 I have seen these on the traditional Korean architecture; the hambok houses and also on all the Royal Palaces. 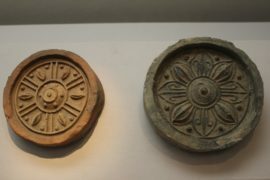 They are circular tiles that clad the ends of the beams used to construct the roofs. Most of the Royal Palaces have painted versions, which are also lovely. This may be because all of the palaces were destroyed twice, once during the Japanese invasion of 15____ and again in the 1950s. 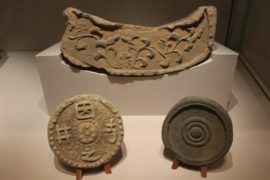 There were also Japanese and Chinese versions of roof end tiles, and almost all depict flowers. So this has given me a new idea, as it panders to my penchant for tiles and is in keeping with the botanical theme. 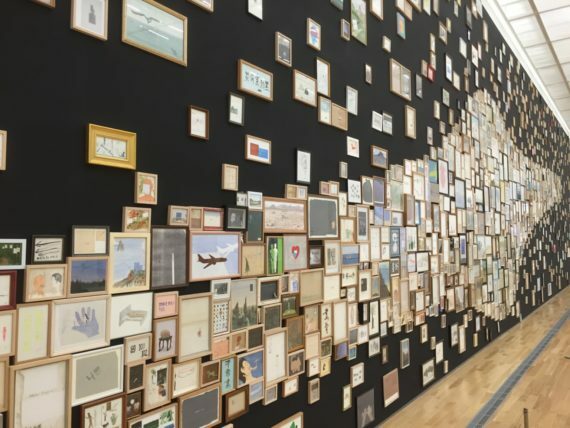 I want to design a big wall installation and this could be a way forward…. Then I had to rush to the next meeting, with Chun Bok Lee. 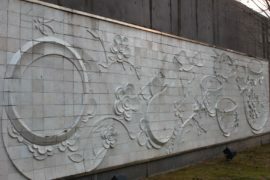 He is a professor at Namseoul University and makes white hand-built sculpture, which is wall-based or free standing, inspired by forests. He uses a pinching method, and one of the effects I like about this is that you can see the traces of his fingers on the surface of the clay. 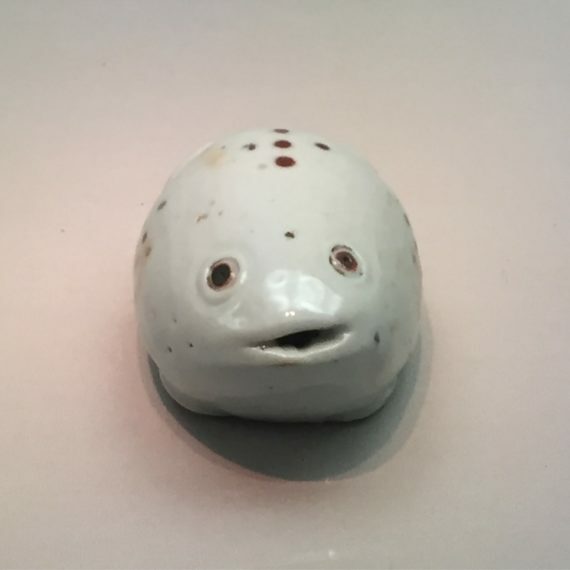 He is a vivacious character and as we talked, and I told him about the idea of including sound in the exhibition, he became really enthused and said, “I can already hear the wind rustling through the bamboo forest”. So that led to the idea of finding a sound artist who can collaborate with him and make a sound piece based on bamboo forests. I love the way ideas flow and morph and lead to new ideas. 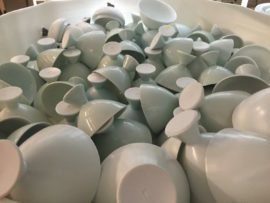 Originally the sound idea was to focus on the sounds of the making process; the hand-made versus the mass produced, and looking at ceramic factories as well as artists’ studios. 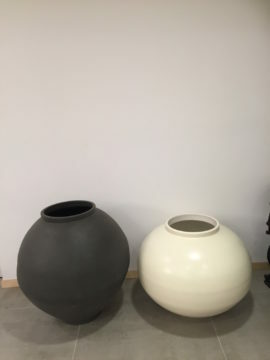 Now I think if we find some sound artists in Korea who want to get involved, they can respond directly to the ceramic artist. The next meeting took place in the same café, so Kyung Won and I spent the whole afternoon there. I had arranged a meeting with Hye Young Cho, a curator who has worked for all the main craft organisations and mainly works for the government now. She was introduced to me on facebook by a colleague with whom I am connected on FB, an artist I have never actually met. 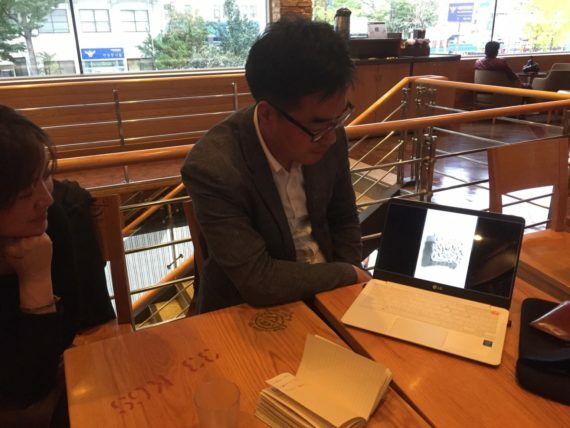 This shows the value of using social media, as it led to me meeting one of the foremost curators in Korea. I invited Kyung Won to come along, as she doesn’t know Hye Young, and I thought it would be appreciated. Hye Young knows most of the artists exhibiting in my show and is obviously a good person to know. 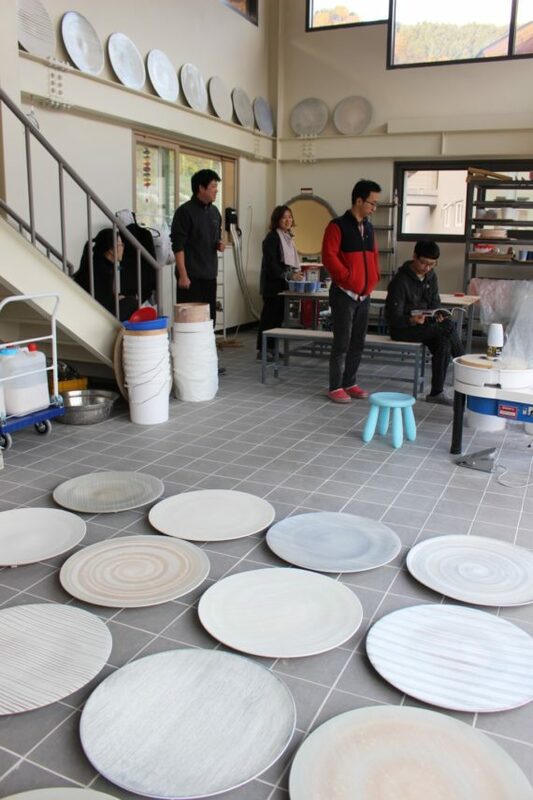 We talked about why I decided to have the Korean show (and as I responded when asked this question at the Seoul University lecture), I said it was because of the article I read in Ceramic Review in 2014 about young Korean ceramists. Well, guess what – she wrote it! 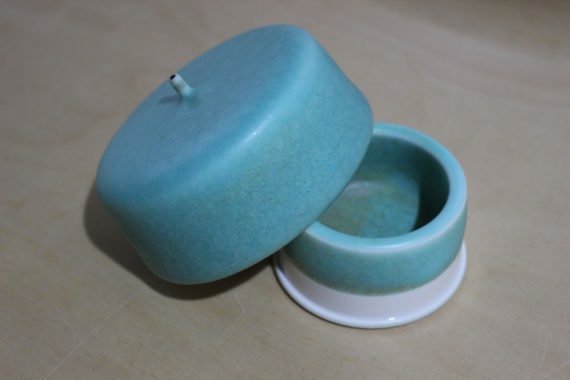 I also had a second invitation from her to participate in the Craft Trend Fair in December. 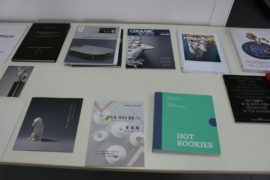 This time, I found myself weighing up the pros and cons – free flight and accommodation, free stand, a chance to promote my work and those of selected Korean artists (I would love to bring over some of my faves who live in the UK and therefore are not so well known on the scene in Korea) – what a great opportunity! But, no. I cannot possibly consider this. 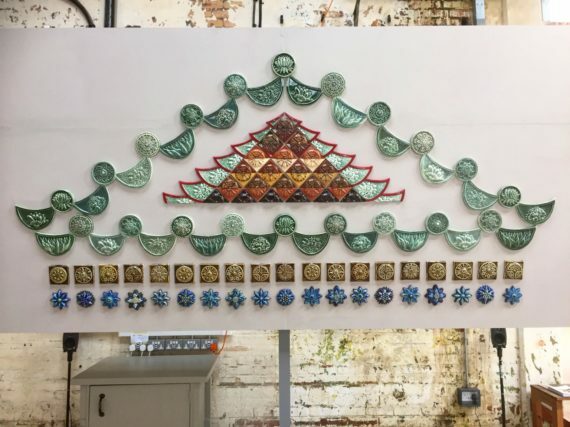 Apart from the funding bid I need to write before Christmas for this project, I have a huge public art commission to start and my new Korean piece to develop. Next year for sure. 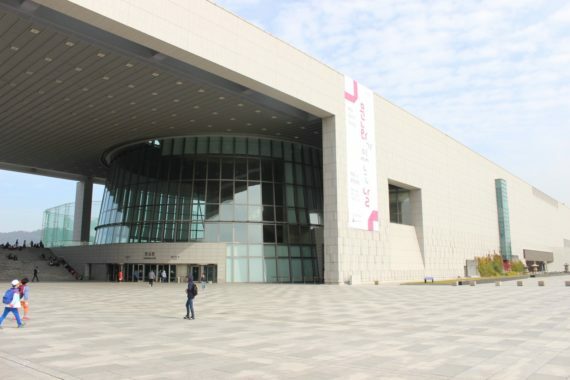 This means I will have (hopefully) achieved one of my goals – to exhibit my work in Korea. Only that in Korea things don’t happen as reliably or in advance as they do back home, and I understand I will not get an official letter of invitation until half way through next year, which is far too late for my ACE funding bid. So I will just have to plan it and have faith that the Korean model works! 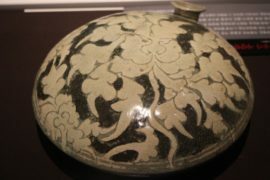 They do sound keen to have foreign galleries exhibiting there who are promoting Korean ceramics, so it is an ideal scenario. Here’s hoping. The day I flew back from Jeju, I went straight from Gimpo airport to the first appointment of my last week in Seoul. Every day we had at least one scheduled meeting. Today we went to see Hye Mi, a graduate from Seoul University. 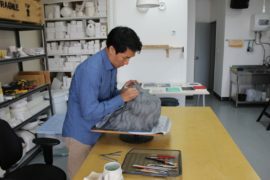 Hye Mi has set up a really fantastic studio along with two other ceramic artists, Sang Hyuk Yoon and Sejin Bae. In fact, this remains my favourite studio of the trip. They have rented a lovely detached house in a very central area, near Chungmuro, and converted the house, with a lovely garden too. They have only set this up in the last year. 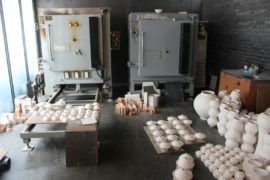 As usual, as is the norm so far in my experience of visiting ceramic artists in Korea, it is extremely well equipped. 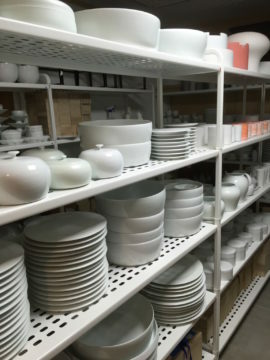 In fact they have double of everything, to accommodate porcelain and stoneware clays, which need to be kept separate (as far as clay preparation goes). 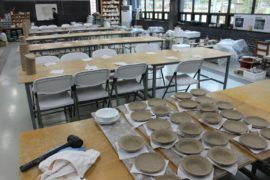 In order to pay the rent, they teach ceramic courses there for 3 days of the week, which means they are slightly restricted in terms of when they can make their own work (which is their priority, as they are all exhibiting and developing their practice), but it seems to be a successful model. Following that, we hailed a taxi and went to the opening of Gallery LVS’ new showroom. What a place. This was one of my favourite places I visited, both the house and the area. 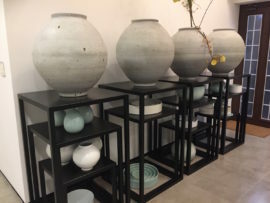 LVS have a main gallery, where they show fine art, a project space where they show ceramics (I went there on my first day in Seoul to Deokho Kim’s opening), and now they have just opened a fabulous new showroom. It is a gorgeous house, immaculately designed to a very high spec, out on the fringe of Seoul beyond the Royal Palace and the Presidential quarter. To get there, we drove between the mountains that form such a picturesque backdrop behind Gyeongbokgung, the main royal palace, and we ended up in a wonderful fairytale-land of steep cobbled streets, traditional Korean houses and tangible history. In fact the showroom has a properly ancient castellated wall running along the top perimeter of the garden. What a treat. Firstly, we were welcomed in and served dinner and then we were shown around. 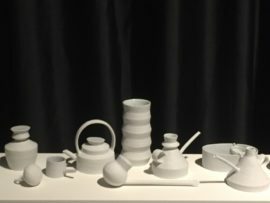 What I liked so much is that is a house, much as The Ceramic House is a domestic environment, that doubles as an exhibition space. I recognised quite a few artists who will be showing in Made in Korea or whose artwork Kyung Won has introduced me to. I chatted with the director and the curator and we discussed the idea of me showing not only in next year’s Craft Biennial (this was first mooted at Deokho’s opening), but I actually was offered a Ceramic House stand at the Craft Trend Fair, which seems to be the main craft fair that happens in Seoul. 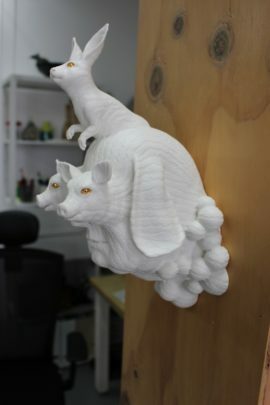 I was offered flight and accommodation, and a free stand, which is excellent – I would have to pay for shipping – as long as I promote Korean artists, as well as my own, which is not a problem at all (who to choose? ), however there was one drawback. She was talking about this year, not next year, which is in 5 weeks’ time! Dain, LVS’ curator, jumped in and put some order into the discussion, dismissing the idea of participating with such little notice. Absolutely right! It would be impossible. Maybe next year though!